I mostly use this blog to document my personal film-making endeavours, so there is normally much to read here about cameras, tests, super 8 and generally experimental film-making stuff. I don't usually write quite so much here about my 'day job', working on commercials and promo films etc. For reasons of commercial and client confidentiality it isn't always possible to write about the things I've been working on. However, a short promotional film I co-directed with Tobias Fouracre a couple of months ago at TANDEM films has just been put online by the client, so I feel happy to embed a YouTube link to it here. 'Start Your Own Journey' is a short minute and a half film commissioned by Transport for London to introduce and promote the latest version of the tfl.gov.uk website. The TfL site is well-known to Londoners who use the site to plan their journeys around the capital. The team at TfL have been working hard to release an updated and improved version of the site so asked us to come up with an entertaining short film to highlight some of the main features on offer. This film was shot in TANDEM's basement studio using A Canon DSLR camera and DragonFrame stop-motion software running on an iMac. Almost all of the 'travelling' shots you see in this film were realised by moving models towards a stationary camera to create the illusion of a continual journey. Tobias came up with the main concept of shooting the film from the first-person perspective of a traveller undertaking a journey through London. I helped out a bit on some model preparation and shooting, but my job was mainly integrating the client's website functionality throughout the film and compositing the piece to make a seamless film. We fortunately had the services of Gordon Allen for the model-making and the very versatile help of Nicola Viargiu who greatly assisted us at all stages of the production. The music and effects for the film were created by Russell Pay of Shrooty. The producer for TANDEM was Emma Burch. 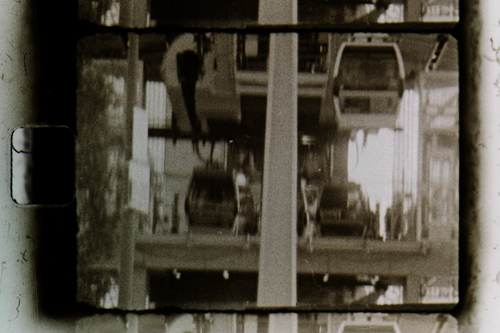 I've been out and about down at the Thames cable car (aka The Emirates Airline) the last couple of weekends with my Nizo camera and shot another couple of cartridges of Super 8 film (Argenti APX 100 BW negative.) So that's another couple of proper 50 foot loads I've put through my DIY film processing spiral tank already. 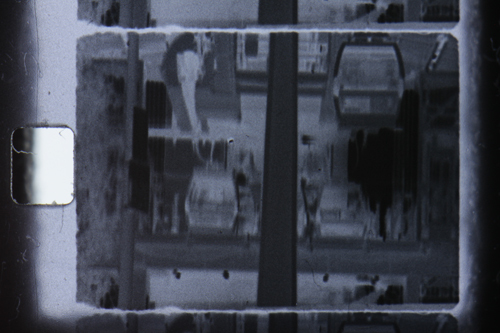 One of the many joys of DIY cine processing is not having to wait a couple of weeks to get your films back! I've processed the first of these 2 rolls using the Caffenol C-M recipe as before, and the last roll using the rather more conventional film developer Ilford ID11. I've written a bit about my experiences with Caffenol in my previous posts, but as I've been seeing VERY grainy results I thought I'd try some 'proper' developer by way of comparison. I do quite like the grain really, but when the images are only around 5mm wide, the magnified effect of the grain becomes quite overwhelming. Now, when I borrowed all of my dad's old film processing gear, there were a couple of packs of developer in there... There was a small pack for making up 1 litre of stock developer and a larger pack for making 5 litres. The smaller pack looked the oldest so I chose to try that one first... This had been bought from a shop called 'Techno' for about £1.60. I would estimate that this film developer was of early 1980s vintage. I read online varying reports of using such ancient chemistry, and there was a fair chance this just wouldn't work at all. Not wishing to risk a full 50 feet of film with these ancient chems, I took the sensible precaution of developing a test strip first. The results looked good so I went ahead and processed the whole roll. The stills below are from this first test strip. I think I'm seeing a lot less grain on these results already... These photos were taken of the film on a lightbox. I used my Canon 600d Camera and an old 50mm Pentacon lens 'reversed' to get the required macro. First test frame of Super 8 film (Argenti BW neg APX100) processed with Ilford ID11 developer. The same frame digitally inverted to a positive.